Preheat the oven to 400. Lightly mist a large baking sheet with cooking spray and set aside. Place the beans in a dish and microwave on high for 30-60 seconds until soft and warm. Pour some water into a small dish and set aside. 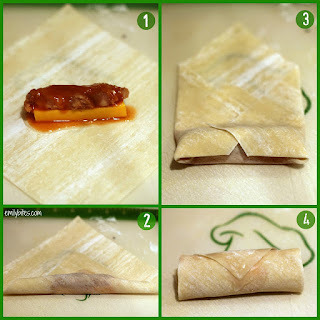 On a flat surface, place an egg roll wrapper, corner facing toward you (like a diamond) and spread half a teaspoon of enchilada sauce horizontally across the center of the wrapper, leaving ½ inch or so of space on each side. Place half a cheese stick on top of the sauce and top that with a tablespoon of refried beans and another ½ teaspoon of enchilada sauce. Fold the bottom corner closest to you up over the ingredients and press. Fold the side corners in and tuck them as you give the filled section a 90 degree roll. Dip your finger in the dish or reserved water and lightly wet the edges of the remaining top corner of the wrapper. Finish rolling the filled pizza log over the wet corner so that it adheres. Dip your finger in the water once again and run it along the sealed edge to adhere. Make sure you press any open edges on the sides closed (see photo comparison below) to avoid leaks. 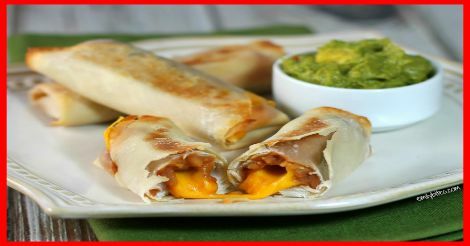 Place wrapped enchilada roll onto the prepared baking sheet. Repeat with remaining ingredients. When all of the enchilada rolls are wrapped and on the baking sheets, mist the tops with cooking spray. Bake for 10-12 minutes, flipping once halfway through, until the wrappers are golden. Do not overcook.